I was contacted by a game translation hobbyist from Spain (henceforth known as The Translator). He had set his sights on Sierra’s 7-CD Phantasmagoria. This mammoth game was driven by a lot of FMV files and animations that have speech. These require language translation in the form of video subtitling. He’s lucky that he found possibly the one person on the whole internet who has just the right combination of skill, time, and interest to pull this off. And why would I care about helping? I guess I share a certain camaraderie with game hackers. Don’t act so surprised. You know what kind of stuff I like to work on. The FMV format used in this game is VMD, which makes an appearance in numerous Sierra titles. FFmpeg already supports decoding this format. FFmpeg also supports subtitling video. 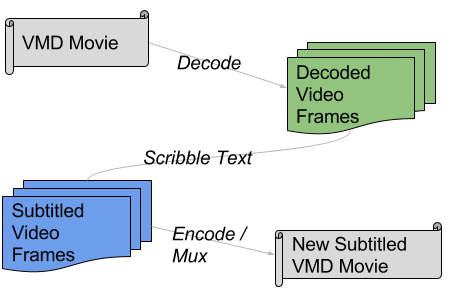 So, ideally, all that’s necessary to support this goal is to add a muxer for the VMD format which can encode raw video and audio, which the format supports. Implement video compression as extra credit. “Trivial!” I surmised. I just never learn, do I? Create a new file muxer that produces a syntactically valid VMD file with bogus video and audio data. Make sure it works with both FFmpeg’s playback system as well as the proper Phantasmagoria engine. Create a new video encoder that essentially operates in pass-through mode while correctly building a palette. Create a new basic encoder for the video frames. A big unknown for me was exactly how subtitle handling operates in FFmpeg. Thanks to this project, I now know. I was concerned because I was pretty sure that font rendering entails anti-aliasing which bodes poorly for keeping the palette count under 256 unique colors. When pondering how to process the palette, I was excited for the opportunity to exercise actual computer science. FFmpeg converts frames from paletted frames to full RGB frames. Then it needs to convert them back to paletted frames. I had a vague recollection of solving this problem once before when I was experimenting with a new paletted video codec. I seem to recall that I did the palette conversion in a very naive manner. I just used a static 256-element array and processed each RGB pixel of the frame, seeing if the value already occurred in the table (O(n) lookup) and adding it otherwise.